Designed with the consumer in mind, The Suncast Collection comprises a versatile selection of furniture and accessories crafted for unique and intriguing outdoor spaces. This Club Chair is an essential piece that complements any outdoor space, and it comes with built-in storage under the seat - the perfect place for a cushion or patio accessories. The chair is crafted from ultra durable resin that's capable of resisting weather wear. Dreaming of glamour and beauty? This gorgeous two-piece club chair and ottoman set feature two of the most iconic celebrities known all over the world. Wrapped in high-grade, printed fabric and comfort-focused cushioning, this club chair will quickly become your favourite spot in the house. Unwind with a good book and enjoy true luxury! Sold as a 2-piece set. This pair of PEX-369-C folding chairs from CorLiving welcome back the days of Mission design, which was popularized in the Southwest during the early 20th century. The contemporary approach to this classic aesthetic sets this stylish bistro chair apart, showcasing it's clean lines and emphasis on the wood grain. The durable wooden frames have been treated to withstand the elements while the black cushions offer additional comfort. These chairs fold up for easy storage in the off-season months. Relax in style! The contemporary design is sure to compliment any outdoor setting. The high back design provides maximum comfort and support. Rounded armrests create a fresh modern look. Practical and functional as it is elegant. Durable resin construction with a smooth finish that is virtually maintenance free. Relax in style and sophistication, and enjoy the outdoors with the Beacon Park Swivel Glider. 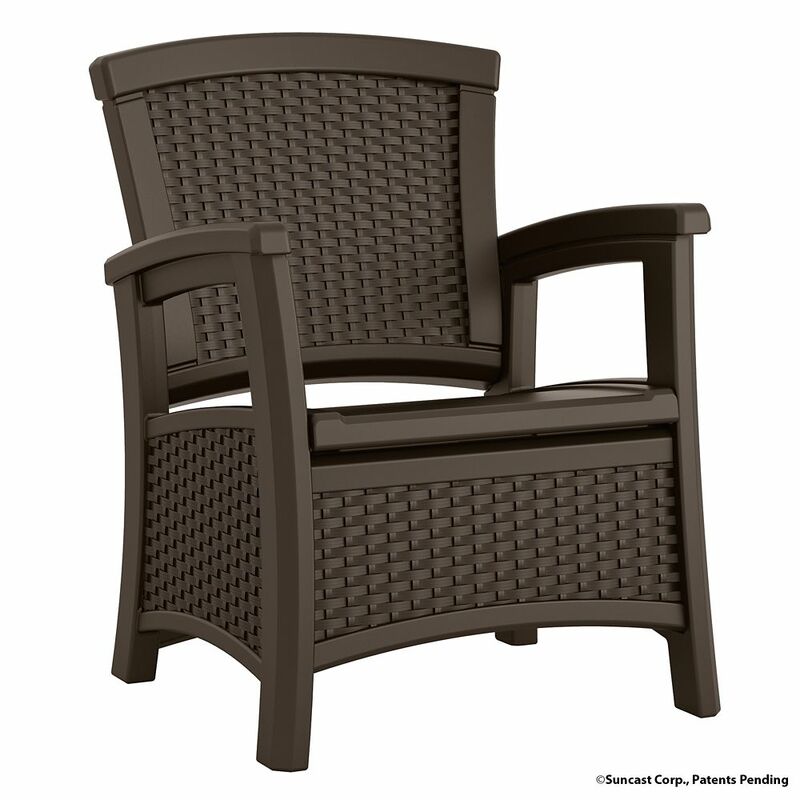 A sturdy, yet durable frame supports intricately woven, wicker, and features a plush olefin seat cushion with reversible back cushion with a trellis pattern on 1 side, and a toffee color matching the seat cushion on the other side. Wide, curved armrests and the gentle gliding motion ensure maximum comfort you won't want to give up. Use as a standalone piece, or include other Beacon Park furniture elements to create the perfect look. Suncast Outdoor Club Chair with Storage Designed with the consumer in mind, The Suncast Collection comprises a versatile selection of furniture and accessories crafted for unique and intriguing outdoor spaces. This Club Chair is an essential piece that complements any outdoor space, and it comes with built-in storage under the seat - the perfect place for a cushion or patio accessories. The chair is crafted from ultra durable resin that's capable of resisting weather wear. Suncast Outdoor Club Chair with Storage is rated 4.8 out of 5 by 4. Rated 5 out of 5 by Natman from Feels like a solid product, very sturdy. Feels like a solid product, very sturdy. Rated 5 out of 5 by Lacy75233 from Great Chair I bought this as a gift for my father in law. He is a big man and needs a sturdy chair. This one is perfect. He added a small chair cushion for a softer seat and it works great. There is then storage for the cushion! Rated 4 out of 5 by Suze from The chair is very solid but not the most attractive outdoor furniture. The chair is very solid but not the most attractive outdoor furniture. Rated 5 out of 5 by Edub3283 from Resin Chairs Great product and look for 1/2 the price of high end or luxury club chairs. Love the storage underneath!